CMSWillowbrook built this Leadership in Energy and Environmental Design (LEED) Certified energy efficient building on the OSU-OKC campus in Oklahoma City. 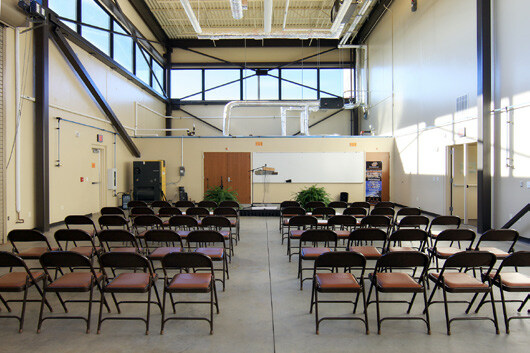 The OSU-OKC Engineering Technology Center is a showcase engineering facility that utilizes many LEED factors. It includes a geothermal well HVAC system, two sets of solar panel pinwheels and a wind turbine that was donated to the university. It houses classrooms for learning in the following areas of study: Fire Protection & Safety, Wind Turbine Technology, Construction/Surveying/Architecture, Electronics, and CAD. It also includes offices and conference rooms to assist in the learning process. The building envelope went up quickly as it is constructed of insulated pre-cast concrete panels and structural T members. All the electrical & control conduit was cast into the pre-cast at all exterior walls. This required much coordination with trades. However, there is much less work for these trades to complete in the field.